Are your broken Large Office Printer in the way? We recycle large office network printers at our recycling center everyday. We have the dollies, manpower and knowledge needed to handle these safely and in an environmental friendly manner. Large Printers are very expensive. Their price range typically start at $2000 + dollars. These are heavy printers that weigh over 50 pounds. It usually takes 2 people to comfortably move these around. We will also pick-up at your office for an additional fee based on your Zip Code. Larger printers are easily recognized by the above picture. There are thousands of these recycled every year. Larger corporations usually use these as a central printer, connected to a network, for everybody in the office to use. These printers are typically leased through a service contract and therefore professionally installed and maintained by a IT professional. The life expectancy for such a printer is typically three to six years. These printers usually have 4 separate ink cartridges, one for each color and one for black. Ink cartridges cost are anywhere from $100 and up. These printers weigh between 100 and 300 lbs, and are sometimes mounted on wheels to make moving them around a little easier. It takes at least 2 strong guys to pick these up. These printers can easily be confused with medium printers if they don’t have the bottom part of the printer / cabinet. These printers always have more than one paper tray to handle all types of paper sizes and paper stock thickness. 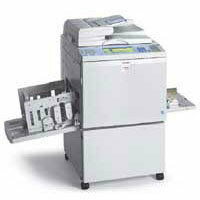 Large printers are high resolution printers which will easily print 30+ pages per minute. They are typically 8 times the size of a small printer. They typically have a print counter to keep track of print count. Some manufacturers are Sharp, Xante, Xerox, Ricoh, and Zebra.